Big, kawaii like turquoise and grey inner, perfect for both Comic Con and manga conventions. These beautiful contact lenses can have two kinds of uses. They can make a perfect costume accessory used on special occasions, such as Halloween or cosplays, but they can also work for some people, who like to change their appearance and are fans of so called 'kawaii' style, which is associated with Japanese manga culture. 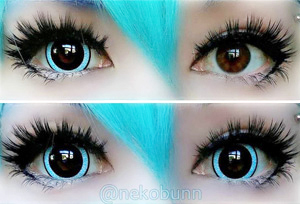 ColourVue Nebulos contacts are very big (17mm diameter), but the don't cover the whole eye, which means that they can create an impression of large eyes, just like in manga and anime characters. They will find their use in manga and anime conventions, cosplays and various other costume events. Some people might even wear them every day! Just remember that they only come in zero power.